Euro 2016 and Rio Olympics, both are indispensable in 2016. As the third-time host nation of the UEFA European championship, France arrives in the spotlight, and everything about it is therefore driven to the forefront. Take the French music for example. Search for best French songs keeps rising, out the purpose of learning French or so. If you want to get acquainted with French sounds in an enjoyable manner, the following top 10 French pop songs list will suit your need. Plus, great French pop/love songs, 2016 best-selling singles in France, and French famous songs download guidance are shared for you to study French with ease. 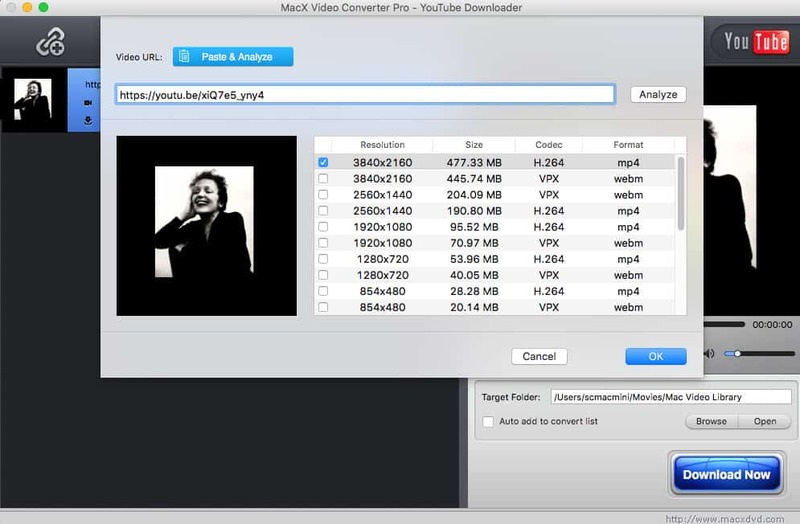 MacX Video Converter Pro - Download French hit songs, classic pop/love songs in France, French popular songs, beautiful ballads, odes, French chanson and other fair-sounding music from YouTube, Vevo, Vimeo, Facebook, Dailymotion, etc at lightning speed. French music is elegant, emotional, passionate and gripping, and you have your own favorite French songs list based on your own taste. But the following list of top 10 French modern songs we've complied with a good mix of pop, rock and love music have gained high reputation among song listeners. Hope the best hit list is ideal for French learners or entertain the music fans. La Vie En Rose, literally Life in Pink, is one of the most celebrated songs in French history and becomes a favorite with a worldwide audience. The Chanson was the signature song of French best Chanteuse Édith Piaf, detailing the troubles of war time and the loss of love. Je l'aime à mourir by Cabrel topped French music chart for five consecutive weeks since its premiere. In France, the single sold 500,000 copies, making it to the top of best-selling French songs and becoming one of the greatest love songs of 20th century. Shakira performed the lyric-driven song twice in France. The classic French hot single embodies Rina Ketty's breakthrough in 1938, which depicts the anxious wait for the return of a lover. It has the particular resonance during World War II, no surprising it became one of the best French songs during WWII. Critically acclaimed by listeners as "Brel's ultimate classic", Ne Me Quitte Pas proves it worth the best song in French history, being covered in the original French by many artists and translated into many other languages, including the well-know English lyrics "If You Go Away". Except the song La Vie En Rose, Edith Piaf, the queen of French love songs, also performed another famous French chanson - Non, Je Ne Regrette Rien, which is written by Charles Dumont in 1956. This French song is featured in many movies, including Inception, Madagascar 3, etc. La Mer became an unexpected hit in 1946 and has been an influence for many re-workings to date. It is said the track was wrote on the back of toilet paper in less than 10 minutes during a long train journey. Tous Le Garcons et Les Filles is another legend among the top French music. This song performed by Francoise Hardy found instant fame in France and other French-speaking regions as well since its release. With a catchy tune, it talks about the feelings of a youngster who has never known love. A'Toi is performed by Joe Dassin, who created gems during his 70-legend music career, among which A Toi remains one of the most popular of these. This great French love song recounts the memories of a couple in love. Je t'aime is a controversial French duet written by Serge Gainsbourg, which reached no.1 in the UK but was banned in several countries due to the sexual content. Regardless of this, it was still a big hit in French and UK and definitely went on to become one of the most famous songs of all time in French. This is one of the greatest French songs about friendship and has been translated by the band Asleep at the Wheels. The song was written for the film Les copains and depicts the close friends who joined Brassens on boating trips off the South coast of France. Besides the above mentioned 10 best French songs in top hit list, there are many other great lyric-driven French songs with best reviews that even transcended France and French language and recognized the world over, such as Mourir d'aimer, Car Je t'aime, etc. But we've helped you dig more in the following part to download (hot) French (love/Hip-pop/rock) songs in MP3/MP4 HD online if you'd like to listening offline. Frankly, there are many music streaming sites like YouTube offering these heart-stirring French music. But in case you are out of wifi or 4G network connection, you'd better to get downloads of these super hit songs in French with a music downloader like MacX Video Converter Pro. It is able to download best French love songs, chanson, lyrical songs, pop, hip hop/rap, rock, and acoustic/folk music, etc from over 300 online video sites and output these hot songs in French language in MP3, MP4, AAC, AC3, etc that suits your different needs. Step 1: After you free download, install and run the music downloader on PC or Mac, hit the YouTube button to load its video downloader feature. Step 2: Search the French song you'd like to download from YouTube or other music sites, like Vevo, Grooveshark, etc. then copy and paste the link of the French music. Tap the analyze button, after which this tool will automatically fetch the song's information. Step 3: Once the song's title, duration, resolution, codec, format and size show up, just check the one you like most. Step 4: Click Download Now button to start French pop songs download process. Optionally, you can tap the box "Auto add to convert list" to enable video conversion if you are willing to play the downloaded French hot singles on your mobile devices.